El plazo figura en una mensaje enviado por el egiptólogo Zahi Hawas, secretario general del Consejo Supremo de Antigüedades (CSA), a los responsables del museo, informó la agencia oficial egipcia de noticias MENA. 'Si la máscara no es recuperada antes de una semana, nos veremos obligados a adoptar las medidas legales necesarias, como presentar una demanda ante un tribunal norteamericano y una denuncia a la INTERPOL', advirtió Hawas. Entre otros pasos, figura el envío de cartas a los estudiantes de las escuelas estadounidenses para que no visiten un museo donde 'se exhibe una pieza egipcia robada', indicó el responsable, que recordó que envió otro mensaje anteriormente al museo 'pero este hasta ahora no ha respondido'. Hawas dijo que la máscara, descubierta en 1952 por un arqueólogo egipcio en unas excavaciones en la localidad monumental de Saqara, en el suroeste de El Cairo, probablemente fue sacada fuera de Egipto entre 1959 y 1999. La pieza, fabricada de una mezcla de telas y yeso, y que representa el rostro de una joven llamada Ka Nafr Nafr, es del tipo que se usaba para cubrir la cara de las momias. Cairo - Egypt threatened Tuesday to take legal action against a US museum unless it returns an ancient mask in its collection that the authorities claim was stolen from a warehouse years ago. The St Louis Art Museum has a week to turn over the 19th dynasty (1307-1196 BC) mask of Ka-nefer-nefer or face legal action, according to Zahi Hawas, secretary general of Egypt's Supreme Council of Antiquities (SCA). "I have informed the American side in a letter that if they do no respond to our request we will take the necessary legal measures and file a case in a US court and inform Interpol," the antiquities chief said in a statement. Egyptian egyptologist Zakaria Goneim excavated the mummy mask in the Saqqara area some 25 kilometres (16 miles) south of Cairo in 1952 and registered the artifact, which was then stored at a nearby warehouse. It depicts a young woman with inlaid glass eyes and a gold-coated face wearing a wig and holding a wooden amulet in each hand. Officials believe the mask disappeared between 1959 and 1990.The SCA said it heard nothing about the mask until an enthusiast saw it at the St Louis museum and informed the council. Hawas said the SCA contacted the museum and requested that it return the artifact, but was met with a refusal. It is currently on display at the museum, which claims to have purchased it 1998. Egypt has warned it will end cooperation with foreign museums and institutions that buy stolen artifacts. ST. LOUIS, MO -- International intrigue and the smile of a 3,000 year-old mummy are at the center of controversy at the St. Louis Art Museum. The Egyptian government says a precious artifact here in St. Louis was stolen. At the St. Louis Art Museum, behind the gaze of centurions and maidens, are antiquity smiles. The complexion of a young woman named Ka Nefer Nefer is recorded in this 3200-year-old mummy's mask, discovered near the pyramids of Egypt in 1952. Her woven wig and piercing eyes molded of glass tell Dr. Sid Goldstein, Ph.D., Curator of Ancient and Islamic Art, that she served King Ramases II well. "Glass is an extremely rare object at this period. Glass was just being understood," says Dr. Goldstein. "We're assured she was a woman of great wealth. She was obviously someone in the court or near the court because she was buried near one of the pyramids." Nefer's mask was purchased by the museum in 1998 for nearly a half a million dollars, but now the Egyptian government wants it back. "About 10 days ago, we received a letter from Dr. Zahi Hawass, who is head of the Supreme Council on Egyptian Requisition, that the mask, which is in the museum's collection, is stolen from Egypt," says Brent Benjamin, Director of the St. Louis Art Museum. "That's a very serious charge," says Benjamin. Benjamin says he has sent Egyptian officials proof that the mask was carefully researched before the purchase. 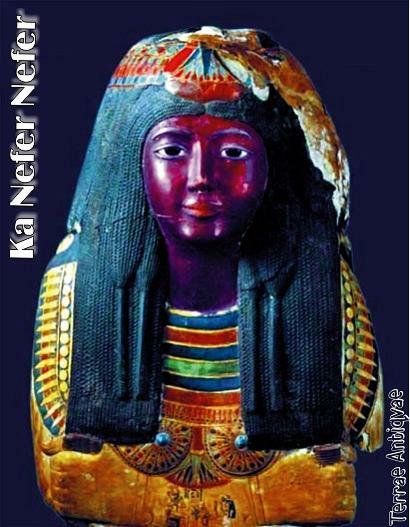 Researchers do know something about this woman, Ka Nefer Nefer, who, after thousands of years is still speaking. Engraved on the mask, Nefer is kneeling before Osirrus, god of the underworld, preparing for her journey into the after life. "You can just make out her name, which is written on her hand," says Dr. Goldstein. The mere mention of it ensures her uncertain destiny from her darkened alcove. "In Egyptian mythology, she is reborn every day, and noting people are seeing her and reading about her makes her live on." "And they figured they were supposed to be alive for eternity," says Goldstein. THE MUMMY mask of Ka-Nefer-Nefer, one of the most beautiful 19th Dynasty pieces ever to be found in Saqqara, is now exhibited in St Louis Art Museum (SLAM) in the United States. For the last eight years it has been the museum's chief attraction and now Egypt is calling for its return claiming it was illegally smuggled out of the country some time in the 20th century. Was it in fact stolen and how was it smuggled out of Egypt -- if indeed it was? How did it happen, and what is its future? These are the questions that are being hotly debated between the Supreme Council of Antiquities and international Egyptologists on the one hand, and the SLAM's board of directors on the other. Zahi Hawass talks to Nevine El-Aref about the legal, ethical and moral issues involved, and demands the immediate return of the mask. "If SLAM does not comply immediately, we will contact Interpol and start legal proceedings," he said. Whose mask is it, anyway? Several international experts are claiming that a 3,000-year-old cartonnage mask on display at the St Louis Art Museum in the United States was smuggled out of Egypt. Nevine El-Aref relates its mysterious provenance. At the southeast corner on the first floor of the St Louis Art Museum (SLAM) a 19th-Dynasty mummy mask stares proudly through glass-inlaid eyes. Her smiling face is smothered with gold and her head is adorned with startling black wig decorated with a gilded lotus flower. She is a noblewoman from the court of Pharaoh Ramses II called Ka-Nefer- Nefer, and in each hand she holds a wooden amulet signifying strength and position. A delicate scene carved in relief on her arms shows her successful ascent into the afterlife on the boat of the Great God Osiris. For eight years now, since the mask was purchased from the Phoenix Art Gallery, Geneva, in 1998, Ka-Nefer-Nefer has been the SLAM's central attraction. Daily hundreds of people visit the museum just to admire this rare and fine example of ancient Egyptian heritage. However, when it comes to bringing objects from abroad all is not smooth sailing, and early this week Egypt requested the mask's return. The Egyptian Supreme Council of Antiquities (SCA) claims it was stolen and smuggled illegally out of the country at some time during the 1970s. In a letter sent to the SLAM, Zahi Hawass, secretary-general of the SCA, alleged that the mask was Egyptian property and had been misappropriated and certainly illegally removed from Egypt. He notified the SLAM that the mask should be returned, and that if it were not Egypt would take concrete steps to launch an official request for restitution. "The mask belongs to Egypt," Hawass told Al-Ahram Weekly. He insisted that by every standard, from the strictly legal to the ethical and moral, it must be returned immediately. "We are asking for the SLAM's cooperation, and if this is not immediately forthcoming we will contact Interpol and start legal proceedings," Hawass said. According to records held by the antiquities department the funerary mask of Ka-Nefer-Nefer was discovered in 1952 by Egyptologist Zakariya Goneim while he was excavating the area of the unfinished Step Pyramid of the Third- Dynasty ruler Sekhemkhet on the Saqqara necropolis. Along with many other finds from the excavation the mask was placed in the so-called Sekhemkhet magazine, which was situated to the south of the pyramid of Unas. This and all the contents of the magazine were the property of the Egyptian Antiquities Authority, now SCA. In 1957, Goneim published the discovery in his book The Buried Pyramid, which also contained illustrations showing him and the mask in situ. According to the Saqqara inspectorate records, which are well documented, the Ka-Nefer Nefer mask and other objects discovered during Goneim's excavations were taken to the Egyptian Museum in Tahrir Square for a special exhibition. A trawl through the museum's documents, however, has produced no evidence that the splendid mask ever entered the Egyptian Museum. Moreover, it was found that several of the other objects discovered by Goneim that had been sent immediately to the museum were stored unregistered until 1972. Goneim himself died in 1959, and since that year there has been no mention of the mask in official records. Indeed it was missing until a month ago when Ton Cremers, the Dutch moderator of the online Museum Security Mailing List, raised a question about the provenance of the funerary mask in St Louis by sending an open letter to the SLAM's Director Brent Benjamin requesting information as to how the mask had made its way into the museum's collection. He attached a letter from Maarten J Raven, a curator at the Rijksmuseum Van Oudheden in Leiden and joint field director of the Dutch excavations in Saqqara, verifying what was written in the Egyptian documents. In his e-mail, which was published on the Internet, Raven said that the Saqqara storehouse or magazine, which also served as a repository for numerous finds from the Anglo-Dutch excavations organised by the Egypt Exploration Society in London and the National Museum of Antiquities in Leiden, had been entered by force and plundered in 1985. "It is unknown to me whether the Egyptian authorities communicated this theft at the time. I myself have seen an object from the mentioned storeroom circulating on the Dutch art market in the early 1990s. I would not be surprised if various institutions and private collectors have purchased objects from this storeroom during this period," Raven wrote in his e-mail. He continued that after the theft the storehouse had been partly dismantled by the local authorities and all its contents were relocated to another storehouse at the edge of the Saqqara valley. The question raised by Cremers attracted the attention of several archaeologists and people concerned with such issues. Among them was Michel Van Rijin, a self-appointed art-world watchdog, who in turn published Cremers's piece of information on his website and contacted the SLAM. He also sent e-mails to the Egyptian authorities and to international journalists and newspapers, including the Weekly. Rijin's website alleged that the SLAM had purchased a stolen artefact from the Phoenix Art Gallery run by the Aboutaam brothers, one of whom, Ali Aboutaam, has already been convicted in absentia by the Egyptian Courts for art theft and sentenced to 15 years' imprisonment as part of the El-Seweissi trial two years ago. "The half-a-million-dollar cartonnage mask was stolen from the Saqqara storehouse to order and was subsequently sold by the Aboutaams in 1998 to the SLAM, where it remains to this day, a hostage against the prevailing laws on cultural patrimony," Rijin said on his web page. To support his claim, Rijin published Raven's e-mail. Brent Benjamin dismisses the accusation, and has told Hawass in a letter of response, of which the Weekly has obtained a copy, that the SLAM has great respect for Hawass and the SCA and is prepared further to investigate the claim that the mummy mask was stolen. He also pointed out that before buying such a revered object the museum had carried out extensive research on its provenance, and had confirmed that it was not plundered from Egypt. "The SLAM is not aware of evidence that the mask was improperly acquired," Benjamin said in the letter, adding that the museum had provided documents concerning the work and had requested that Egypt provide additional information. Benjamin, who was not at the SLAM when the purchase of the controversial mask took place, said the museum's information about the mask's provenance was based on what had been provided by the Aboutaam brothers, to the effect that the mask was unearthed by Goneim in 1952 and in the same year it appeared on the art market in Brussels. In his letter, Benjamin emphasised that since the Egyptian government shared the country's archaeological finds with their partners in the excavation process, whether archaeologists or institutes, during the 1950s, it was possible that the mask was part of the Dutch portion. Hawass responded that no antiquities from the Dutch excavations at Saqqara had ever been sold legally or released by the Egyptian authorities. Although the story of Ka-Nefer-Nefer's discovery is well known, its means of exit from Egypt remains a perplexing mystery. According to the SLAM's documents, the mask was first seen in 1952 at an antiquities dealer's in Brussels, and 10 years later it was bought by a private collector who on his turn sold it to a Swiss citizen. In 1997 the mask was purchased by the Phoenix Ancient Art Gallery which sold it to the SLAM in 1998. The SLAM provenance report accompanying the letter claimed the documentation suggested the mask was probably donated to Goneim. "This would never have happened," Hawass told the Weekly. He said that as a government employee who was working on a government-sponsored dig, Goneim was under an obligation to turn over all the objects he discovered to Egypt, even in the 1950s. This rule applied to all Egyptian archaeologists. "It was not his personal possession that he could then take out himself," Hawass said. Most Egyptologists support Hawass's statements and claim that the Egyptian government has never awarded an artefact to its discoverer. Some also describe the SLAM's claims as scurrilous. "It sounds like they did not know the provenance of the mask and are trying to either explain or invent something. But such actions never happen," said one, who refused to be named. In an article about the mask The Art Newspaper quotes Peter Lacovara, ancient art curator of the Michael C Carlos Museum at Emory University in Atlanta. It writes: "Reached via e-mail, Peter Lacovara repeats that the Egyptian government did in fact award artefacts to excavators on occasion. He adds, however, that he was sceptical of the Ka-Nefer- Nefer's provenance from the beginning." Lacovara wrote to The Art Newspaper : "I urged [them] to check the provenance with the dealer as Goneim would be the only possible legitimate source for the mask coming onto the market," "I urged them again and again to contact the antiquities service to make sure the mask was not stolen." Despite the suggestion in the SLAM letter, neither the museum's administrative board nor the Phoenix Ancient Art Gallery were able to provide any documents to show that the Egyptian government had offered the mask to Goneim. On the contrary, Goneim wrote in his book The Buried Pyramid a phrase indicating that he did not own the mask. It says: "I thank the Department of Antiquities of the Egyptian Government, Cairo, for permission to reproduce." Defending the mask's provenance, Benjamin wrote that when considering the purchase the SLAM contacted the International Foundation for Art Research at Interpol and Mohamed Saleh, the Egyptian Museum director at that time, neither of whom raised objections to the acquisition. Benjamin wrote in the letter that Saleh reported that the piece was clean. In a telephone interview with the Weekly Saleh completely rejected this claim and said that to his knowledge the SLAM had asked him whether the mask was once an object of the museum's possession. "I replied that it was not ever," he said. "Now I understand why he was asking about such a mask. The SLAM's director during that time had asked me indirectly and he did not honestly reveal what is in his heart," said Saleh. He pointed out that if he asked me whether it had been derived from Egypt I would have asked all inspectors in Egypt to check their archaeological documents. According to Benjamin, the museum takes seriously any suggestion that it illegally or improperly possesses any object in its collection. Accordingly, "we look forward to working with Dr Hawass towards a fair and amicable resolution of this matter," he says. Aboutaam has defended his company's reputation by publishing an e-mail on the Internet saying that "everything we have is an exercise in due diligence before we buy it. "There is always a risk when you buy an antiquity, but we try to avoid it. We have a policy that we will take anything back and refund the money." Over the past 30 years, however, source countries such as Egypt have imposed a thicket of legal impediments to be fought through before any antiquities can be legally exported. In 1970 the United Nations Educational, Scientific and Cultural Organisation (UNESCO) adopted its Convention on the Means of Prohibiting and Preventing the Illicit Import, Export and Transfer of Cultural Property, which binds member nations to help retrieve stolen or illegally- exported items at the request of another member state. The United States was a late arrival at UNESCO's party, implementing the agreement in 1983. That same year the Egyptian government passed a law mandating that any cultural artefact unearthed in Egypt after 1983 belonged to the Egyptian State. Egypt even succeeded in implementing this Egyptian antiquities law in an American court during the trial of the notorious antiquities dealer Robert Schultz four years ago, leading to his conviction. "Anything discovered in Egypt is owned by the Egyptian government," Hawass told the Weekly. "So anything illegally taken from the ground of Egypt is stolen property." Both the SCA and the SLAM will now be digging through their records to prove their respective claims.